Addonics presents the CiperUSB, a pass-through adapter that encrypts data stored on flash drives, flash media, USB hard drives, as well as Blu-ray, DVD and CD media. Addonics Technologies (www.addonics.com) today announced the Addonics CipherUSB, a USB pass-through adapter that provides a simple, inexpensive way to encrypt data stored on flash drives, flash media, USB hard drives as well as Blu-ray, DVD or CD media. The CipherUSB is the size of a typical flash drive. Just plug the USB drive, flash drive or optical drive to the device end of the CipherUSB, and then plug the CipherUSB into your computer’s USB port. The drive will appear on your computer in seconds and is ready for use like an ordinary USB drive. There is no password to remember or software or drivers to install. Data written to the USB drive or burnt onto Blu-ray, DVD or CD media is automatically encrypted on the fly with “Top Secret” level AES 256-bit hardware encryption. You can even mix encrypted/unencrypted burning sessions onto the same optical media. The encrypted drive is accessible on any computer with a USB port as long you have the matching CipherUSB. 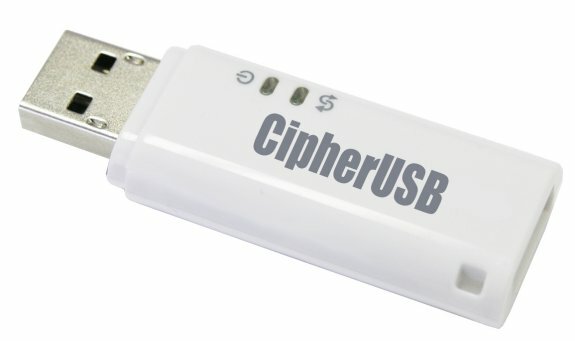 The CipherUSB has an MSRP of $29.95 and is now shipping.